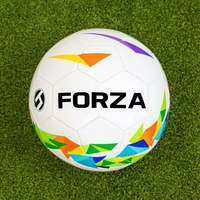 18.5ft x 6.5ft FORZA Alu110 Freestanding Stadium Box Football Goal. 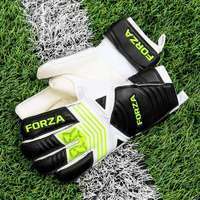 110mm reinforced aluminium frame, 5mm braided box net and 4-point net tension system. Optional wheels and weights. 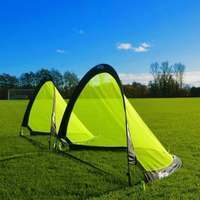 The ultra-durable 5mm HDPE braided box goal net offers enhanced performance and reliability without sagging down the centre. This flaw is commonplace in inferior box goal nets, but due to the innovative 4-point net tension system and extra rear bracing bars, this premium box goal net remains taut and in shape throughout use. Our heavy duty puncture proof alu110 goal wheels are the perfect option for clubs and coaches who train on multiple pitches. The lever type goal wheels do the heavy lifting so you don't have to, raising the goal up to an impressive 100mm off the ground with its unique CAM mechanism. The extra wide wheels have a diamond tread. Designed specifically to fit within the profile of the goal frame, the internal counterbalance weights are a premium option for those who wish to take extra health and safety precautions. The specially moulded UV treated weights require filling with water, sand, stone or metal prior to use to provide protection against upturning and movement. 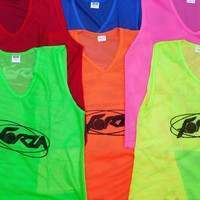 Training is incredibly vital to a clubs chance of achieving success. 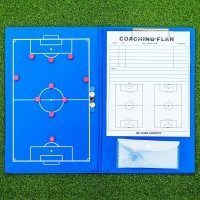 This premium 18.5 x 6.5 freestanding box stadium football goal has been designed to replicate the conditions of a real match goal, providing worthwhile coaching sessions. 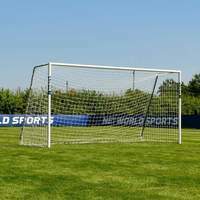 The pristine box football goal net has adorned professional pitches, bringing the stadium to the training pitch. 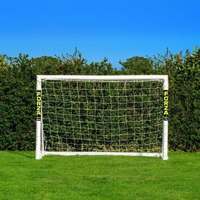 Manufactured to stand at 18.5ft x 6.5ft, this is the best football training goal on the market, sized specifically for use by clubs and players of various age groups. 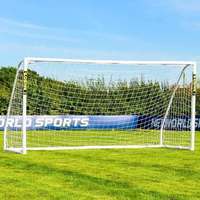 This cutting-edge 18.5 x 6.5 box stadium football goal features a professional quality 5mm braided box goal net which resembles those used on professional pitches. 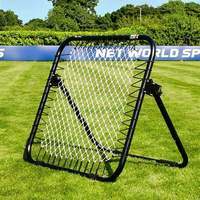 The premium quality box goal net remains rigid and steady under the weight of whatever comes its way during the training sessions thanks to the unique 4-point net tension system and extra rear bracing bars. 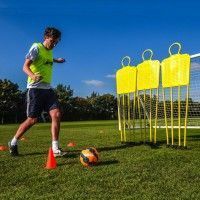 This consistent and reliable box goal is the perfect companion to training sessions, offering the durability to withstand regular use. 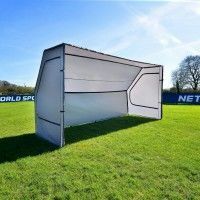 Capable of retaining its premium nature all season long, this box stadium training goal is a true market leader. 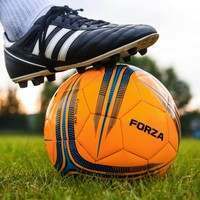 Manufactured to bring the stadium to the training pitch, this quality 18.5 x 6.5 box football goal delivers valuable training sessions to clubs and coaches at all levels. The box goal net eliminates the common of flaw of unsightly sagging in the middle, having been expertly manufactured for unmatchable quality. The premium box goal offers levels of quality that are several steps above the competition, with this 5mm braided twine box football goal net representing an exceptionally high-performing acquisition. 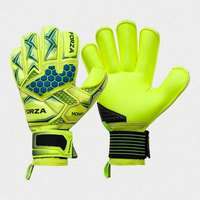 This professional football net is fully weatherproof for use outdoors throughout the year without becoming fraught or damaged. 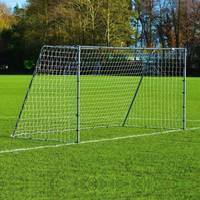 Strength and durability is at the heart of this premium quality stadium box goal. 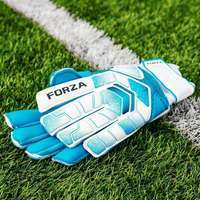 The strong 110mm reinforced aluminium goal frame combines supreme robustness with a classic design to provide a long-lasting and dependable training goal which is guaranteed to raise the levels on the pitch. The tough goal frame has been powder coated for weather-resistance while also maintaining a light in weight touch, offering portability as well as exceptional toughness. Freestanding in design, the top of the range training football goal can be used on any playing surface, including indoor hard pitches . There is the option to upgrade your box goal and take the strain out of lifting. Our optional heavy duty goal wheels feature an innovative CAM mechanism which raises the goal up to 100mm off the ground so you don’t have to. 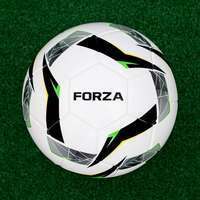 This makes the process of maneuvering the goal a simple one, effortlessly gliding across all surfaces with ease. Made from tough black rubber, the premium goal wheels are incredibly durable with an extra wide design and deep diamond tread which prevents sinking into muddy grounds. 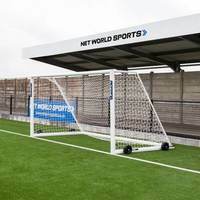 The 18.5 x 6.5 stadium box goal complies with worldwide match regulations, as well as passing independent testing to BS EN 748/8462 safety standards. To take health and safety precautions even further, you can include optional internal counterbalance weights with your goal. 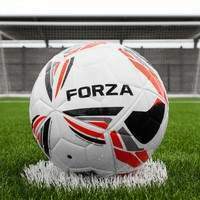 The weights have been specifically moulded to fit the profile of the goal frame, inconspicuously slotting into the goal with ease to prevent upturning and undesirable movement. The weights take water, sand, stone or metal to fill up for the optimum performance.